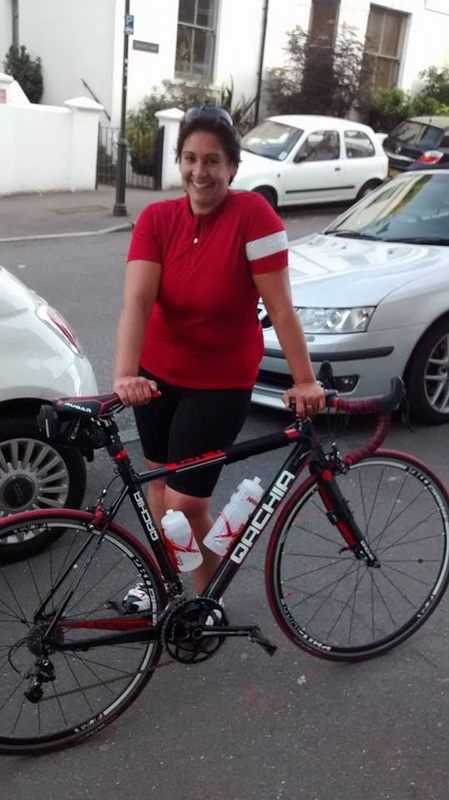 Our latest cycling voice comes from Sarah Strong, a stalwart of the London women's cycling scene. She's been there, done that, got the T-shirt plus a few scars. But she's strong by nature as well as by name. I've known Sarah since she got into cycling over 14 years ago and I commend her for all the work she's done in the sport. But Sarah has my utmost admiration for winning a Pointless trophy! 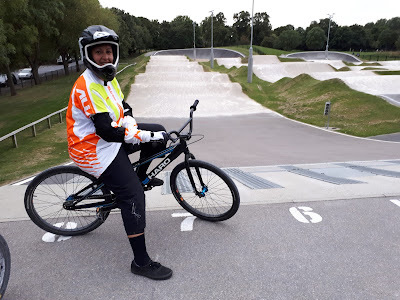 As a child our family were never into cycling, but I did do BMX biking in the mid-1980s between the ages of about 9-12 years when I got into it via a school mate. It felt kinda cool, and there were only three or four of us girls who raced regularly. One went to the same school as me and it was good to chat to her about races. My mate Dave, and I used to go to get taken to the BMX track by his dad so we could practice with the local club, Burgess Hill Bombers. There was also a wooded patch near my house with a natural bombhole, and rooty jumps, that we used. You could get some decent air on some of them - well, it felt like that, but it was probably only a few centimetres! There were also the usual homemade ramps set up next to local rows of garages or quiet cul-de-sacs. I really enjoyed doing something a bit different. Then when I hit teenage years I stopped doing it, mainly as I wasn't that sporty so didn't enjoy it that much. My mate Dave got a mountain bike (which at that time was becoming fashionable), and my interest fizzled out. When my real passion for cycling kicked off later, as an adult, my parents were happy to hear that I'd found something that was clearly benefiting me a great deal. Nowadays I cycle more than my sister does and I suspect she thinks I'm a bit mad! When her partner and I talk bike stuff I can hear her eyes rolling! I have been club cycling for about 14 years now. 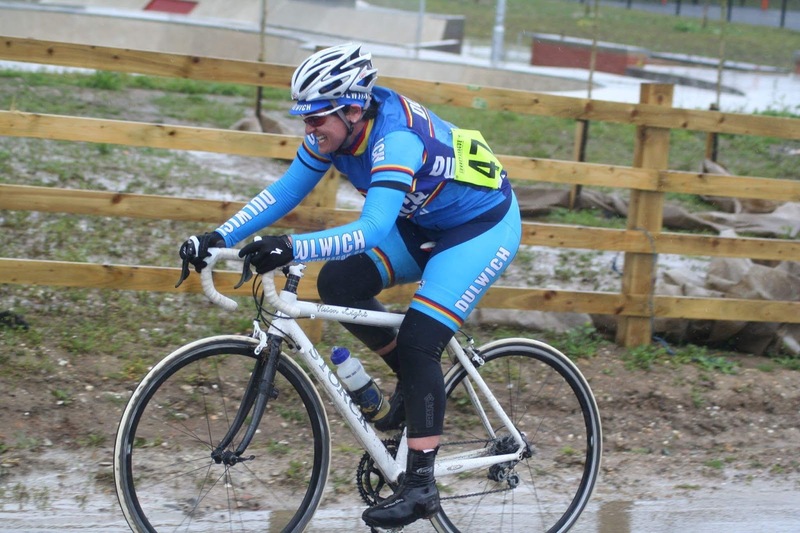 It all started at the Beastway Summer Mountainbike Series in 2003 when I was recovering from a bout of depression. A housemate asked me to help out her club one week when it was their turn to volunteer at one of the rounds. Initially it was the social side of the race series I warmed to, and being out in the fresh air, doing something new. I became part of the organising committee of Beastway, (the Structureless Tyranny) working on it for the next nine summers, and was usually to be found doing sign-on and lap-scoring duties. It led me to start using an old bike I had, to commute to work, and to have a go at racing myself. Six months later I bought myself a second-hand road bike and have never looked back. My first cycling club was London Phoenix, where a few of the regular Beastway riders were members. But proper club cycling didn't happen for me until a year or two later when I moved to South London and joined Dulwich Paragon. Riding my first club run with them was rewarding but exhausting. After thirty hilly miles from Crystal Palace to the edge of Kent and back on a Saturday morning I spent the rest of the day on the sofa! Gary MacGowan (a Dulwich Paragon stalwart) was the friendly and encouraging face that led me and my friend to return for more. 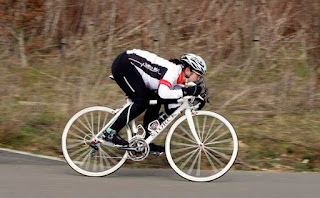 It was while at Dulwich Paragon that another Sarah (Atkinson) convinced me to try a women's beginner road race, organised by London Dynamo, at the Longcross Test Track (Chertsey) back in 2009. I raced two of those and would have actually gained three British Cycling racing points in the second race if I'd bothered to buy a full licence! I was so chuffed! Then Maria David convinced me to do the first (of two!) cyclocross races around the same time. I wouldn't have tried it without her encouragement. 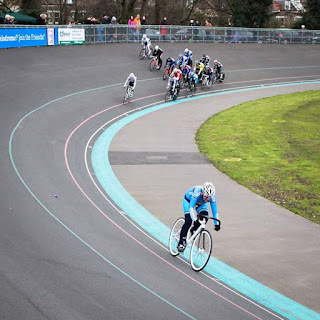 Being near Herne Hill Velodrome was a great opportunity to try track cycling, and the Women's Training Sessions started by Anna Glowinski kicked off my track riding and racing. My friend and club-mate Lesley Pinder also persuaded me to join her down at HHV on regular occasions. Track cycling has been fun. I raced at the National Track Masters in Newport about 18 months ago, though I didn't have any goals as such. It was more about taking part because my fitness level was not brilliant at the time, and I was just happy not to have been the slowest in my age group! 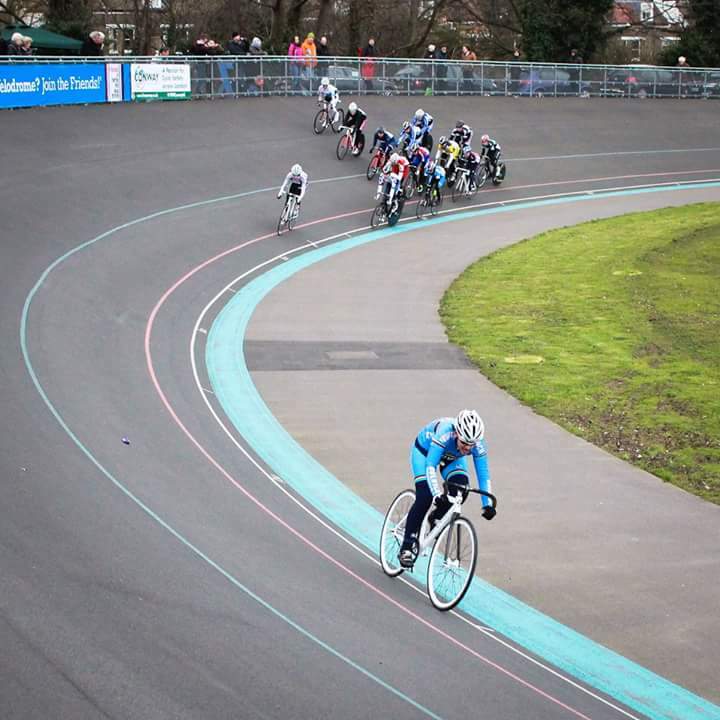 Aside from the Masters and Herne Hill Velodrome track league I haven't raced much at all in the last two or three years. Criterium racing is what I have enjoyed the most. There, I felt the most comfortable about my ability and skills on several of the London circuits. When I was race fit I loved the feeling after a crit - at least once I’d got through the first fifteen minutes of thinking my lungs were going to explode! I eventually stopped racing around 2014/15 as I felt like I wasn't achieving much. In 2009 I was knocked off my bike by a car while commuting to work and needed surgery on my knee. Then in 2011 I shattered my collarbone in a crash when my front wheel hit a massive pothole at the Dunwich Dynamo. When I came back to racing in 2012 I found myself on the start line with women half my age who had coaches and a lot more time to train than me. From the gun I would be immediately spat out of the back. I just didn't have the mental fight. Long-distance cycling is something else I do. 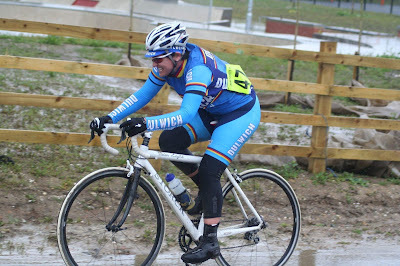 I did my first sportive, the 110-km Ride of the Falling Leaves (by Dulwich Paragon) in 2006. It was the longest ride I’d done at that point, and it was such fun. Since then I’ve done more rides particularly after I stopped racing. I did a couple of trips to the Pyrenees with clubmates, and Paris-Roubaix in 2008. The cobbles are a special kind of hurt but the sense of achievement at the end was immense. I felt the same after the Etape du Tour in 2013. I do enjoy long rides, seeing the countryside and having a range of feelings, thoughts and sensations, compared with the eyeballs-out nature of racing. 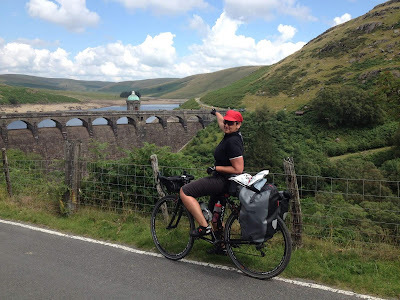 On one long ride, though, I nearly got into a bit of trouble when I did some solo riding in mid-Wales. I ran out of water in the middle of the Cambrian Mountains with over twenty miles to go, all uphill and into a headwind, and no phone reception there either! It was a tough moment and I was quite worried about how I would get back to my lodgings. There were no shops, no one around and just one or two cars passed me. I really had to push myself mentally and battle through it. When things got tough I just had to risk it and take a bit of water from the River Ystwyth. When I got home the first thing I did was to devour a pack of Pringles! I did gain the confidence to know I can do it, if I end up in a similar situation. In 2017 I did my first ever cycle tour, with friend Kat who I originally met some years back through the London Fixed-Gear and Single-Speed group. I was rather anxious about it as I’d never ridden long distances with panniers and camping gear etc. before. We did a horseshoe-shaped loop around half of Wales over one week. It was hard, but amazing. There were highs and lows, tiredness and hunger, wonderful sights, lots of laughs, and excellent company. I also realised I didn’t object to camping as much as I’d been telling myself for years! I’d like to do more touring. Funnily enough I have recently taken up BMX biking again. It's just for fun and I do it in the summer. There are women's sessions on Tuesday nights at Burgess Park (near Peckham) that I go to. My skills came back quite quickly, but as I am now bigger, taller, and a lot older than when I last did it I don't tend to take risks! I do like shoes. I used to have a lot of cycling shoes, specifically Sidis! I tried various brands in my first couple of years of cycling and Sidis fitted me the best. As a teenager I had corrective surgery on both feet and have since had issues finding shoes that are comfortable for me. So when I found some that fitted so well I started finding reasons to buy more! At one point I had eight pairs of Sidis - one for each of my bikes! These days I’m down to five pairs, and I haven’t bought any in a while. Maybe it's time to acquire some more! A simple bike ride can do wonders for your mental health, but it’s way more complicated than just pedalling your depression away. There is no direct causal link between cycling and wellbeing – it’s a range of interacting factors. Cycling is not a cure-all, and it’s not going to magic away depression forever. It is something I use to improve my mood though, and I start getting a bit grumpy if I don’t do any cycling for a few days. I find that my mental health benefits from the exercise, the independence, and the social circle cycling brings with it (most of my close friends are people I’ve got to know through riding). Riding helps to stop the rumination that comes with anxiety. Occasionally, I’ll return from a ride with a head as busy as it was when I set out – but this is quite unusual. 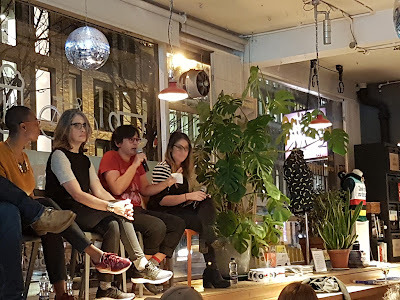 I was incredibly anxious about co-ordinating and presenting the evening we had on cycling and mental health at Look Mum No Hands last Autumn. I’d had a very difficult time the day before too. On the night of the event I didn’t say quite all that I wanted to, but it was more important to facilitate others. The fact that the members of the panel were so willing to contribute made organising the event very easy, and took the pressure off a bit! I as very grateful for their participation and honesty, and it was a valuable evening. We received amazing feedback, and it underlined my feelings that many cyclists experience mental health challenges, and many who experience mental health challenges cycle. It was great to hear how the people who came along, or followed on Facebook live or on Twitter, found it beneficial. There will be an event in Rapha Manchester later this month, plans are afoot for another evening at Look Mum No Hands, and one at the Bristol Bike Project. As part of Sport Relief, which is focusing on mental health, I’ve done a piece to camera on the subject of anxiety for a documentary about a celebrity's experience of anxiety. The programme will air in March during Sport Relief week. Hopefully what I said during the interview made some sense! On the back of that I set up a blog - bikesandbrains.com - and I’m hoping to encourage people to contact me with their contributions. There have been a few responses already, which is encouraging. It would be great to gather a range of voices and experiences so that people can know they aren’t the only ones going through tough times, and also folks might share their ideas of how to manage their wellbeing when getting on the bike isn’t necessarily possible. 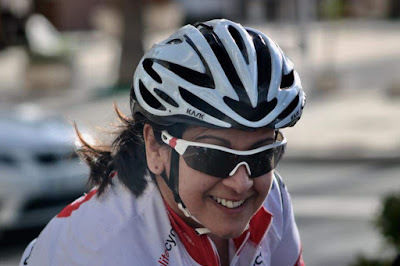 Perhaps I was particularly fortunate to find my way into cycling through people near to me, and I didn’t find it at all difficult as a woman getting into cycling. 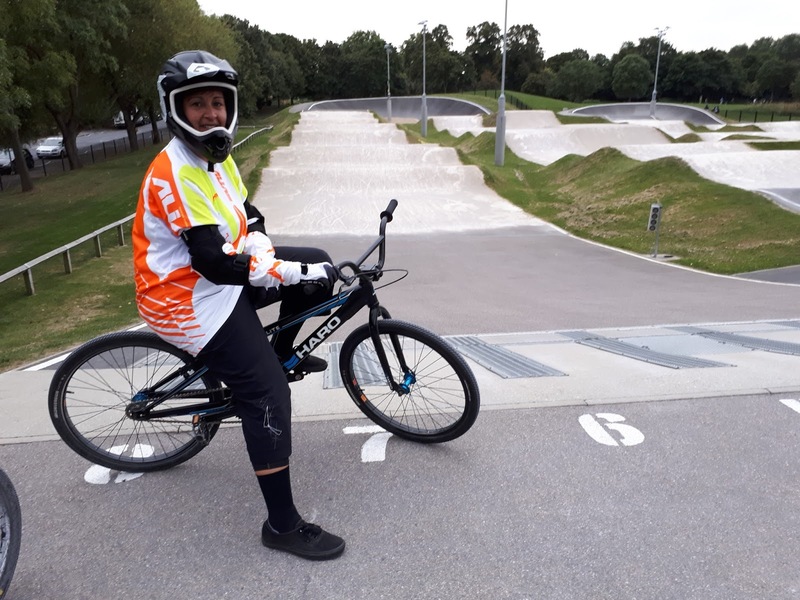 The London cycling scene was somewhat smaller in my early days 14 years ago and, to me, it seemed like a supportive niche of a size I felt comfortable in. Being part of Beastway meant I got to know a lot of riders with experience and expertise, and I could learn from them. I do remember, however, being nervous about turning up to my first Dulwich Paragon club run as newbie, and feeling a bit out of my depth amongst all the matching club kit. There was no need to have worried though, as I was welcomed in the club, and became a regular very quickly. In fact on the few Saturdays I didn’t go on the club ride it seemed a bit odd. At that time, to me there were enough women involved to form a core group of moral support if required. To anyone wanting to get into club cycling I would say have a think about what type of cycling you want to do. Some clubs may be more focused towards racing, others are maybe more social. Larger clubs are more likely to have riders that cover the whole spectrum and there will be opportunities whether you are interested in track, or audax, or cross, or whatever. Look out for clubs that have social rides – many of which you can attend and try out before you join. Check any advice about expected fitness levels and/or ability. When I’m not on a bike I do like attending art exhibitions, and living in London means a wealth of options on the doorstop. I have a soft spot for art, architecture, and design between about 1750-1950. The last exhibition I visited was Red Star Over Russia at Tate Modern. Museums are good too – I had a decent wander around Sir John Soane’s recently. It’s mad, overwhelming and brilliant! Also, I occasionally do a bit of glass-engraving. They are usually one-offs as presents, but I have engraved trophies for the end of series prizes for Beastway a few times, and had other small commissions. It’s all freehand work with a rotary engraving tool, so too much in one go can be hard work on the fingers and wrists. Hatha yoga is something I try and do regularly as I feel relaxed after the sessions, and I hope to take up Mindfulness again to compliment this. 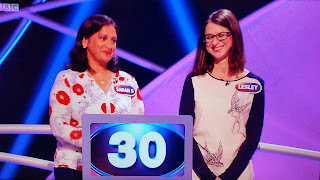 One highpoint for me was being on the quiz show Pointless, with my friend Lesley. It was a surreal experience. We just applied to go on the show for a laugh. When we got the call I was on holiday, so had to take a day out to travel to the studios in Hertfordshire, be there for the day and return to my holidays .Filming was fun, and Alexander Armstrong and Richard Osman came across just as warm and going off on their flights of fancy as they appear on the TV. Answering the questions in front of the camera was a lot trickier than shouting the answers at the TV at home! 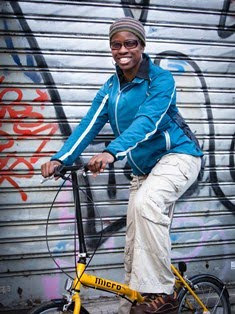 In the cycling world I really admire Kathryn Bertine, who campaigned for a women's Tour de France concurrent with the men’s race. In the non-cycling world I get inspired by older women such as Mary Beard, who challenge the status quo, are passionate, sincere in what they do, and are willing to take risks to follow what they believe in. But most of my inspiration comes from my friends, and often I’ll do things with them that I never would have contemplated on my own. For me, the moral support from friends is invaluable. My ideal day is about being on the bike, with a close friend, in the countryside somewhere on a sunny summer day, with a flexible route and in no hurry to get back home. Writing this in February is filling me with much longing! Sarah will feature in an article by Emily Chappell in the Spring issue of Casquette magazine.